The onslaught of films this fall continues for yet another weekend with four new movies hoping to find the success that for most films this year has been elusive. Halloween weekend is upon us, and although contrary to popular wisdom, it's never been a spectacular weekend for horror films (most people are at parties). It's always been popular for studios to release a scary movie in this frame, or close to it anyway. This year's entry is Saw II, which might be one of the horror films to break through and become a bona fide Halloween horror hit. Released during this same weekend last year, the first film in this series earned a shocking $18 million, obliterating its modest $1.2 million budget. The film centered around a serial killer who developed elaborate and gruesome traps for his victims, forcing them into sadistic games, while covertly monitoring them (get it? 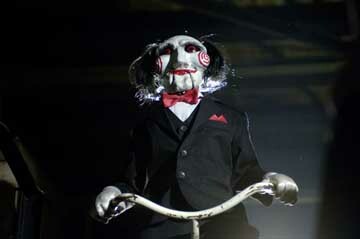 Saw?). It prided itself on being the sickest, most twisted member of the horror genre to come along. This sequel brings back the killer (known as Jigsaw) and several unlucky victims trapped in a room with a potentially lethal amount of nerve gas. If they can avoid the booby traps, they may be able to set themselves free, but I wouldn't count on it.